The nicest looking house plants make it to the plant window. Joe and I will fight about it, but this window is curated, or at least, that's how I defend what stays and what goes back into the greenhouse. This time of year, it's the begonias that look their best. Palms, Dioon, and warm-loving tropicals get first dibs. Across the Internet, on Instagram, Twitter and Facebook - we gardeners (in the colder parts of the world) have been sharing tales of 'the First Frost'. While for most folks this just means dragging out a few old sheets to throw over the tomatoes or dahlias, for others it means a mad rush (because we wait until the last moment) to move heavy pots of tender plants, houseplants and the last flowers and veggies into the house. It's an annual ritual which sneaks up on us remarkable fast, for while spring seems to ease in with a few warm days here and there as early as February or March, autumns arrive comes with an immediacy - a fatal blow of temperatures which dip below 32° F for a few hours, usually here in New England sometimes in mid October. Full disclosure, this post was inspired by a post and podcast last week between two of my friends, Margaret Roach and Ken Druse. It's a great read (or listen) so please do it and others out here if you are doing what many of us are doing in the colder parts of North America this week - moving plants indoors for the winter. And of course...our frost never came. At least everything is now indoors or in the greenhouse. Nothing like looking as if I am completely prepared ahead of schedule. 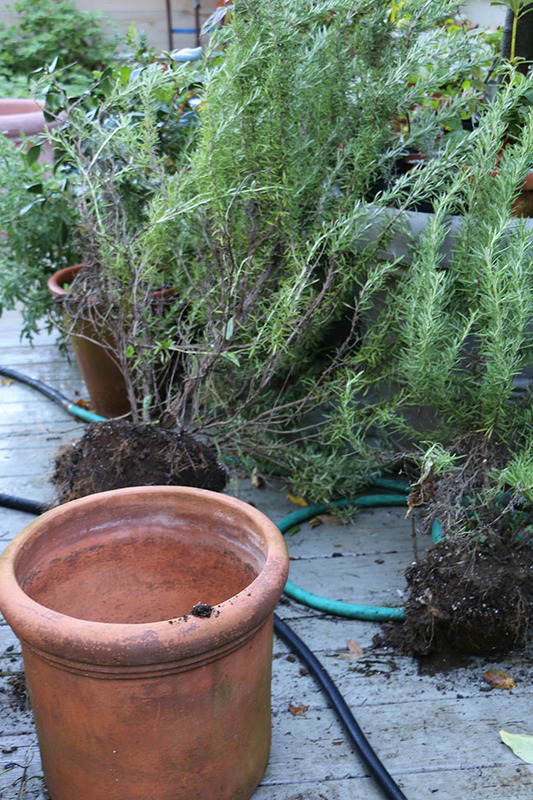 If you've ever tried to winter-over rosemary indoors, you know how difficult it can be. I always feel sorry for those Christmas-tree trained rosemary one sees at the Holidays as potted gift plants. Knowing that most if not all will be dead within a week or two indoors drive me mad, but the fact is that rosemary is a Mediterranean shrub. It requires cool, breezy, buoyant air with a touch of moisture, not hot, dry indoor conditions. My rosemary plants tend to get too large now, virtually shrubs which I love. Fresh rosemary in the winter a luxury I will miss if I cant find a good place to winter them over once we stop heating the greenhouse, but I am going to try keeping a few in our un-heated concrete floor studio. 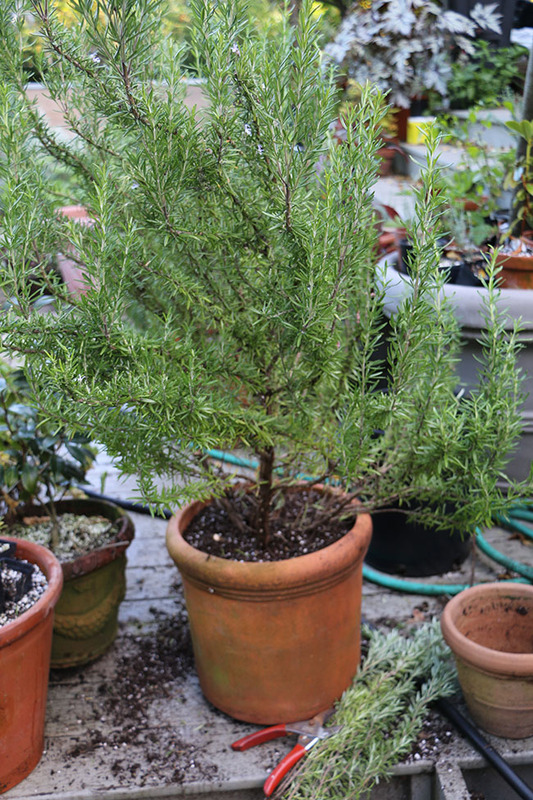 What rosemary needs during the winter months is both the brightest light and cold temperatures. At least as a container plant. The way I treat rosemary now is rather careless. 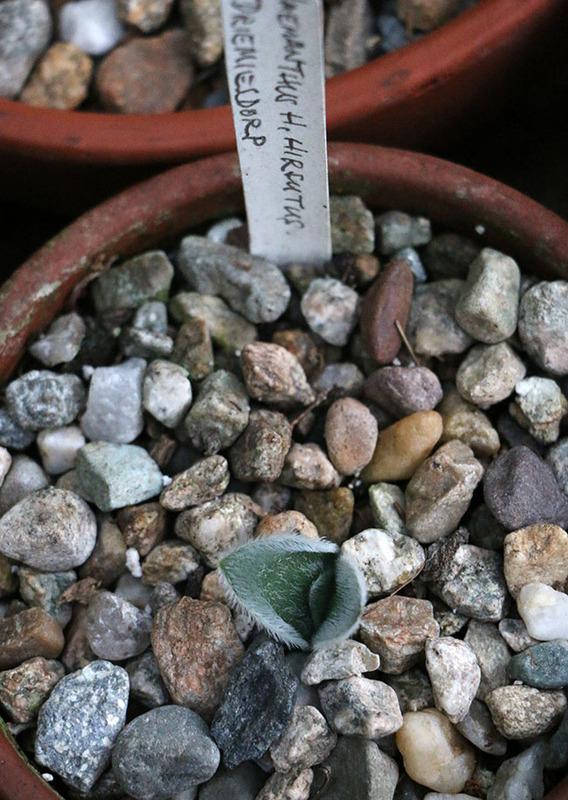 I keep many through the winter under glass where some are even just bare root balls sitting on the gravel under a greenhouse bench, they bloom in the winter and even grow enough so that I can propagate them from cuttings. This tells me that the low temperatures and moisture in the damp. cold greenhouse suits them. In some ways this makes sense. If this was California or the Mediterranean, these shrubs would be subjected to winter rains and cool weather. In the summer, I unpot most of my shrubs and set them into the garden, which allows them to dry out just enough but also keeps them from drying out completely if I forget to water a container. 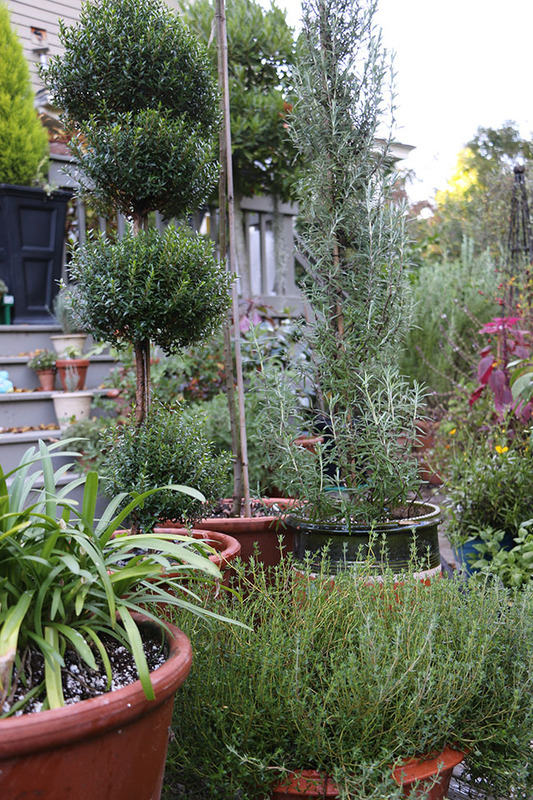 Rosemary doesn't like dampness, as they are prone to mildew and decay if the air isn't moving, but with fans and sunshine, most seem to be able to handle our New England winter if allowed to dry out between watering. This large rosemay shrub was planted out in the perennial border for the summer. A fresh pot of soil, some pruning of stray or awkward branches is all it needs. 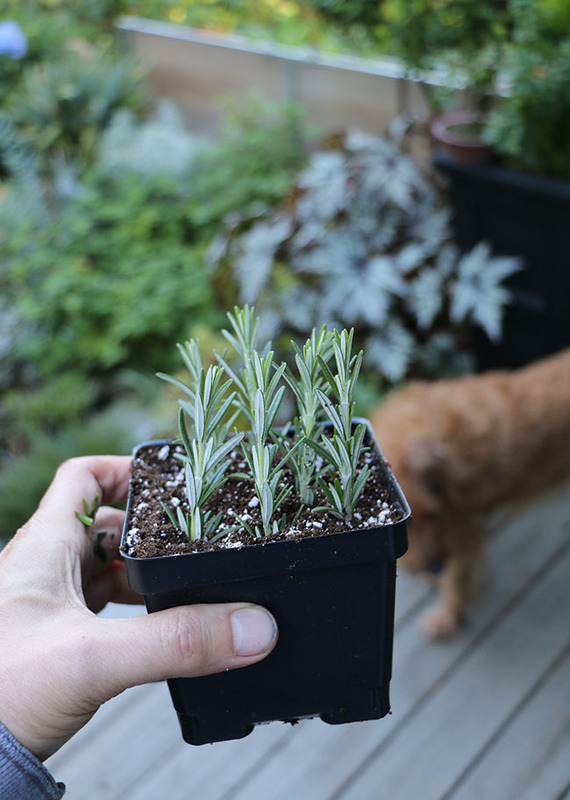 I never cut back rosemary in the autumn, as I want them to bloom in the late winter, and trimming affects the overall appearance. The only rosemary I do trim are topiary forms. This includes domes, cones and topiary standards. I like to use both - natural unclipped rosemary for graceful branching and flowers, and formal clipped plants. I should mention also that my soil mix for rosemary is a mixture of our local clay loam, sand, and commercial potting mix. A dense, sandy blend which isn't fussy by any measurement, but more loam than it is peat. I also notice that very little root growth happens in the summer here. 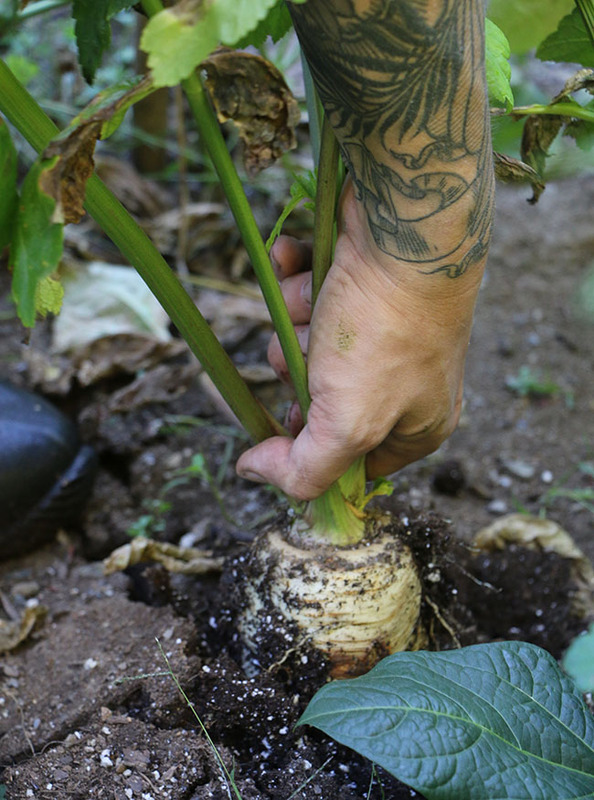 I can dig or pull a large plant out at the end of summer, and the root ball is intact, even though some significant growth on top occurred. I am not sure why this happens. I repot many of my plants in early spring, around February or March while still in the greenhouse and maybe that has something to do with the lack of summer root growth. The plants usually about to bloom then, which signals a burst of new growth as well. I loosen the old root ball and generally repot into the same sized pot, or slightly larger. I've found that under-potting suits them well. Rosemary cuttings are struck now (along with many other woody herbs which are experiencing an autumnal growth spur with the advent of cooler weather). These will root quickly and are already claimed for a project of mine - pots of interlocking globes, or rings-a type of shaped topiary form. I've already ordered the wire, so I am committed. I think I need a straight growing variety, but if not, I have others rooted. Blue agapanthus blooming heavily - the fact that most form flowerbuds in the previous year should affect how we treat containerized plants in the north, since autumn is a critical time when plants need adequate moisture and nutrition. Wintering over agapanthus, or Blue Lily of the Nile is rather easy, but getting plants to bloom again can be tricky. Myths about over-wintering Agapanthus or Blue Lily of the Nile abound on the internet, which leaves many of us in the north frustrated, while those in warmer parts of the country like California wonder what all of the fuss is about. I am a bit of an amaryllid geek (I collect and grow many plants within the amaryllis family), and because of this, I think I have a few things figured out. Not to brag, but I worked really hard trying to master what is perhaps the most notoriously shy bloomer in the family - the nerine. 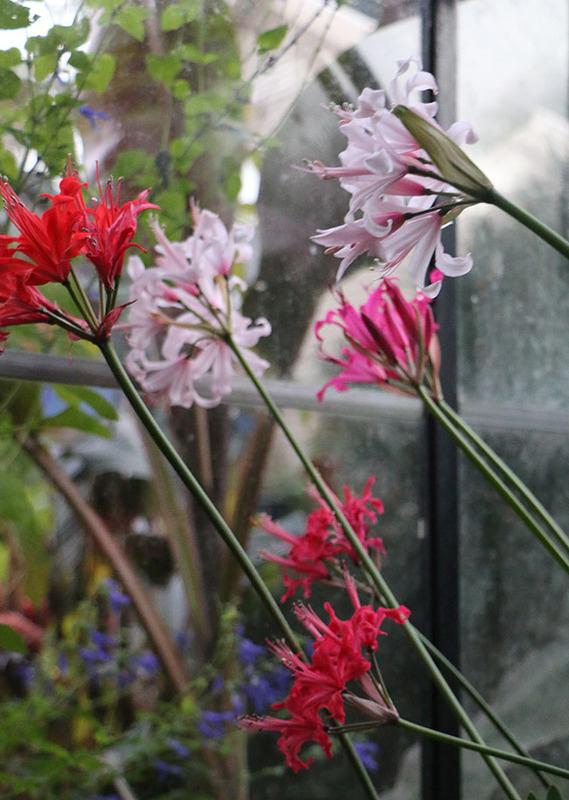 Nerine sarniensis, related to agapanthus, are true bulbs, and while agapanthus are also geophytes, it's easier to think of them more as 'Leeks are to Onions'. Not really going completely dormant, and always with a flower bud deep inside. These nerine demand special treatment in summer when the enjoy hot temperatures and dry conditions - in the greenhouse, even though they are hot and dry(ish) they still get a few tablespoons of water now and then, as below ground, their roots are growing madly, and I know that they form flower buds three years in advance - must protect those. Agapanthus are heavy feeders so plan on feeding them with a rich water-soluble fertilizer all summer and autumn. If you have fear using the blue fertilizer one mixes with water, it may be challenging to get good results with agapanthus. The national collections in England and those who enter the large flower shows like Chelsea feed their plants weekly (yes, weekly) with a 15-15-30 water-soluble feed, and often augment their feeding regimen with additional phosphorus in late summer and autumn when the flower buds for the following year are forming. 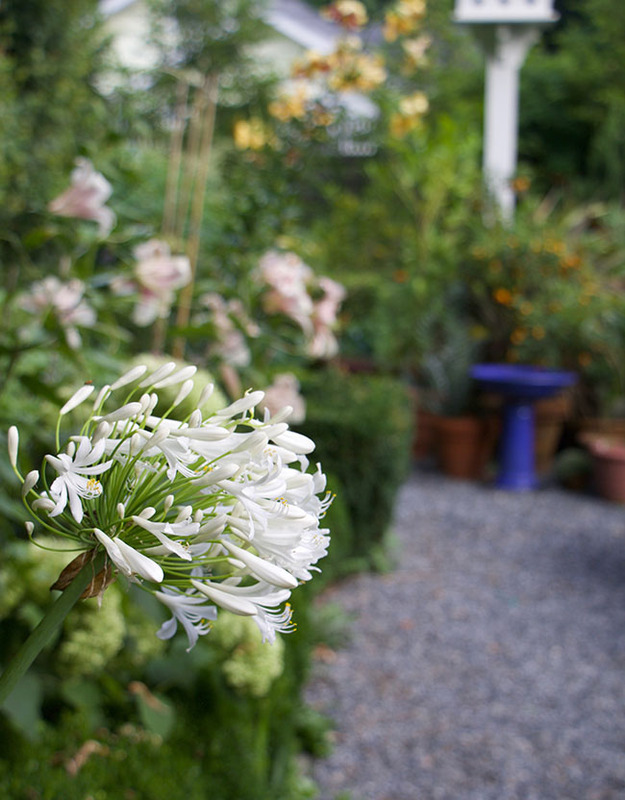 In mid-summer, the agapanthus are often the stars of the container garden. Many of us in the north think that Agapanthus like growing in tub and pots, and that they bloom best if allowed to get rootbound, but actually this myth perpetuates (along with clivia needing the same treatment - another amaryllid). 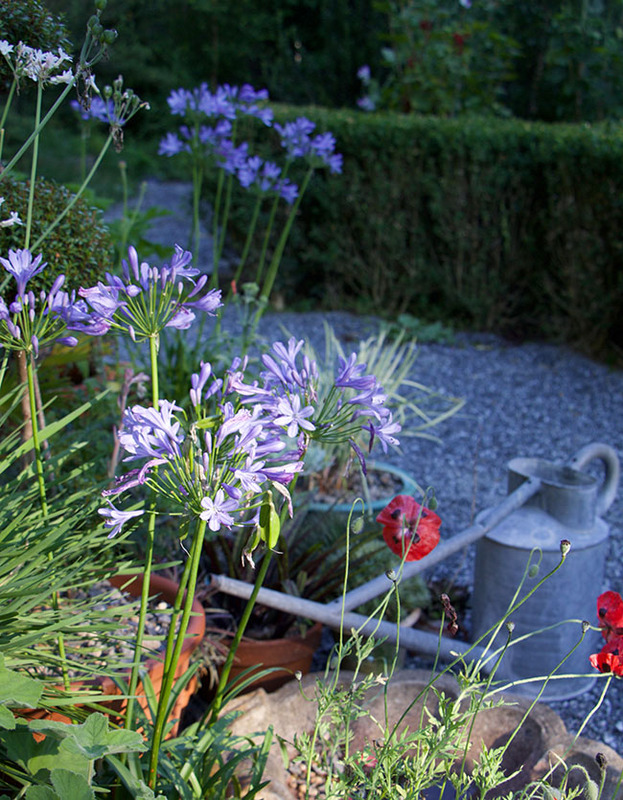 Agapanthus can grow well in pots, but they always do better if grown in open soil. The bit of truth in this myth comes from the fact that agapanthus dislikes having their fleshy, robust roots disturbed, and if they are divided, forget about seeing a good display of flowers for a few years - probably three. Success in containers comes with three things: 1. Find the largest container you can find - anything to reduce how often you will have to divide them. A faster draining soil is helpful (some Brits add gravel to their mixes but I use a high porosity ProMix HP). 2. Water and feed very well during the summer and autumn, when plants are forming flower buds for next year. Room for active root growth and water with good drainage (along with the removal of the current years' flower stems - no matter how pretty you think the seed heads are) will help the plant focus on foliage growth and flower bud formation deep inside the leek-like trunk. 3. 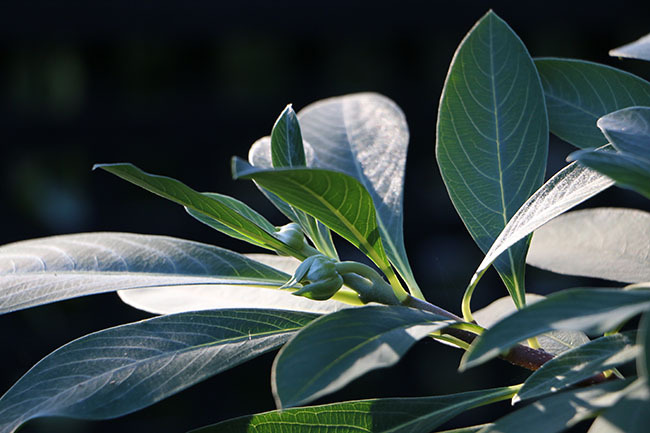 Autumn and winter care that will help protect these flower buds. A un-named white variety - an evergreen form, makes a large specimen plant for us. We keep four tubs, each divisions from when they were divided three years ago. They are just beginning to bloom well this past summer. Evergreen agapanthus varieties have slightly fleshier leaves and seem to handle some frost, and deciduous ones seem as if they can handle light freezes since these are the hardiest types - but the same treatment goes for both - watch out for hard freezes, for while agapanthus growing in the ground can handle freezes, potted specimens can have their flower buds for the following season damaged. I hate to say that a cold greenhouse is an answer, but I should say that it is ideal. Similar conditions might be found if you are clever - an unheated shed that never freezes, an enclosed sunroom or porch that rarely drops below 40 degrees. A cellar is fine if it is cold, but I would suggest moving large agapanthus tubs to the protection of a porch or cool room until well after Thanksgiving to allow flower buds to mature deep inside the plant. Not scientific advice, but one which I presume works, as I've tried most everything else, and feel that my problem in the past came from insufficient feed and bringing plants in too early, or leaving them out to experience hard frosts too long. My theory is reinforced by those who grow collections in the UK. Two major growers have discovered that in some winters, the entire collections of agapanthus have been lost due to unexpected freezes. Now, all of my potted agapanthus, (both evergreen and deciduous) get the same treatment. They are brought into the greenhouse just near frost (around mid-October), set under the benches where they still get some sunlight and daylight so that they can vernalize as best as they can. Most importantly, they seem to bloom heavier if I continue to water them well. At least until the weather turns very cold, around December, when I let up. Adequate moisture and food seems to be the trick required for heavy bud formation. Our towering blue agapanthus Storm Cloud were divided two years ago, and many divisions were potted up into 12 inch pots. This year I've repotted them into 16 inch long toms, but blooms are still sparse. At this stage, great care must be taken to not allow the pots to freeze, and with additional food and potassium, they may bloom better next summer, but it's the following year when allowed to grow in 40 inch tubs when they should take off. The seed pods on the dwarf selection on the left should have been removed earlier. An agapanthus spending a winter in a cellar where it is cool is a fine alternative, but I would try to allow plants to grow a little longer, either indoors or on a cool porch, along with a bit of moisture to ensure that buds fully form. Then bring plants into a cooler location to "sleep". I wouldn't be surprised that day length and temperature shifts help manage floral displays as well, for clivia and nerine are day-length and temperature sensitive, which affects blooming. The easiest way around this dilemma is to allow plants to get a natural day length, making a window in the cellar or garage with no artificial lights in the winter helpful. Others write about wintering over agapanthus in breezeways or sunrooms. These should be fine as long as the pots don't freeze. Agapanthus are tough plants, and while the plants can survive even harsh abuse, often creating spectacular foliar displays, it's bloom, and abundance of bloom one really wants. If someone is offering advice to you, make sure that they are showing photos of their results for it is easy to winter agapanthus over, but it is very tricky to get them to bloom well. If you have not been fertilizing your agapanthus all summer, it may be too late now. Just make a mental note to begin next spring. Additional potassium is very helpful in high summer to really get well-blooming agapanthus. That's what exhibitors in the UK and commercial growers apply throughout the summer growing period along with a balanced feed (20-20-20). If you feel uncomfortable feeding plants with high doses of plant food, you may want to steer clear of agapanthus, or simply appreciate the foliage. On the right is a tall, cone-shaped topiary rosemary. This is an upright form, which only wants to grow ramrod straight-up. I don't know the exact variety as I found the plant in an old estate greenhouse in Connecticut, but it has white flowers. Cuttings of many herbs are taken at this time too since most have produced the strongest and healthiest growth during the summer. These pots of thyme were started from cuttings I took last fall, and are nice and dense now, and ready for new cuttings. 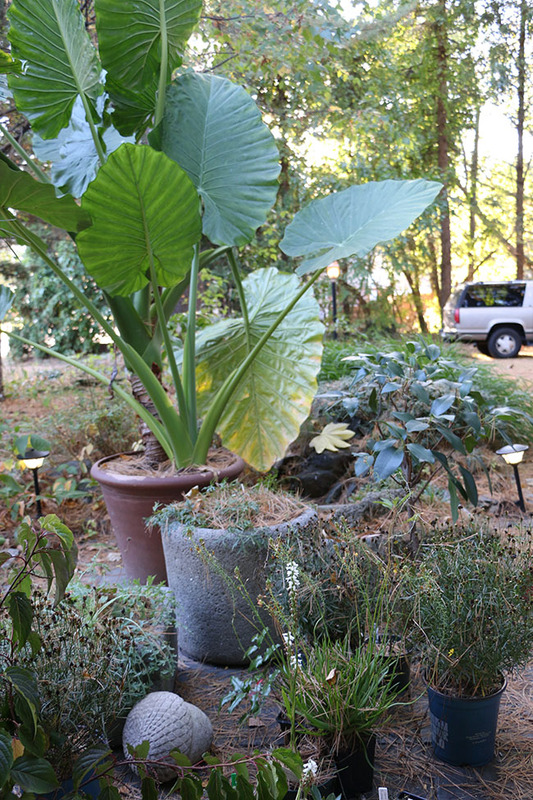 On the left, a dwarf agapanthus and a topiary myrtus await being moved into the greenhouse. Woody herbs remain outdoors in my garden until mid-November or early December. This includes all varieties of thyme, some rosemary, and culinary sage. Tender mints and tender thyme (like Cat Thyme) are brought into the greenhouse. Each of these will be propagated in mid-winter for garden plants next year, and the mother plant tossed. Until then, they provide herbs for the kitchen, soups and Holiday roasts. Some plants that spent time in the greenhouse last winter, were just planted out because I knew that they would be too large and woody to bring underglass for another year. 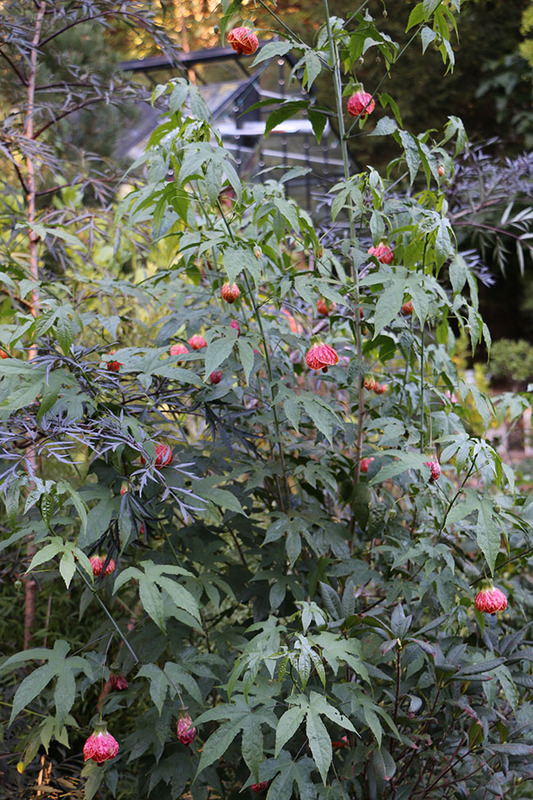 These I will take cuttings of, such as this flowering maple, or Abutilon. The strong growth made during late summer should produce strong, healthy plants. The same goes for scented geraniums. I have so many, but they are massive. 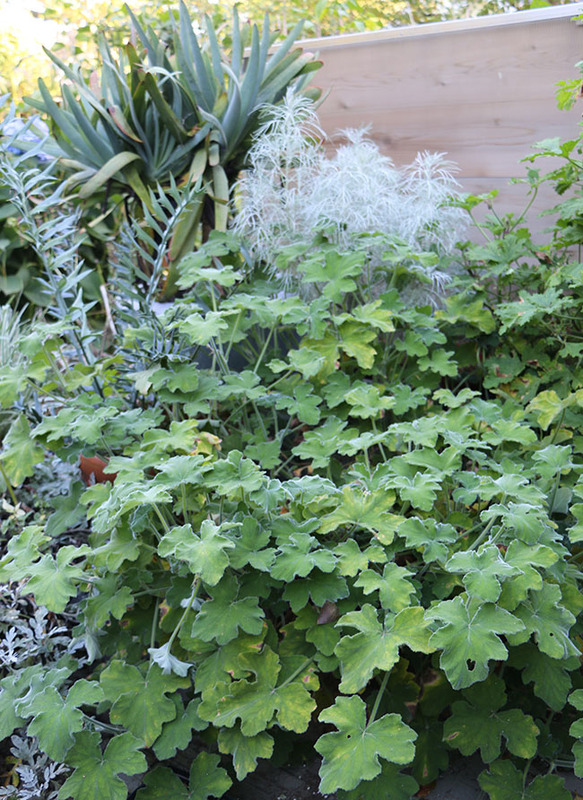 This peppermint scented geranium is in a pot believe it or not, it is nearly 6 feet in diameter, so cutting are in order. It will root easily. I was suprised to hear last weekend at a family reunion that my great aunt who live in abig, white house the street next to ours (and who was born in 1889), had a large scented geranium collection in her house according to her great grand-daughter. 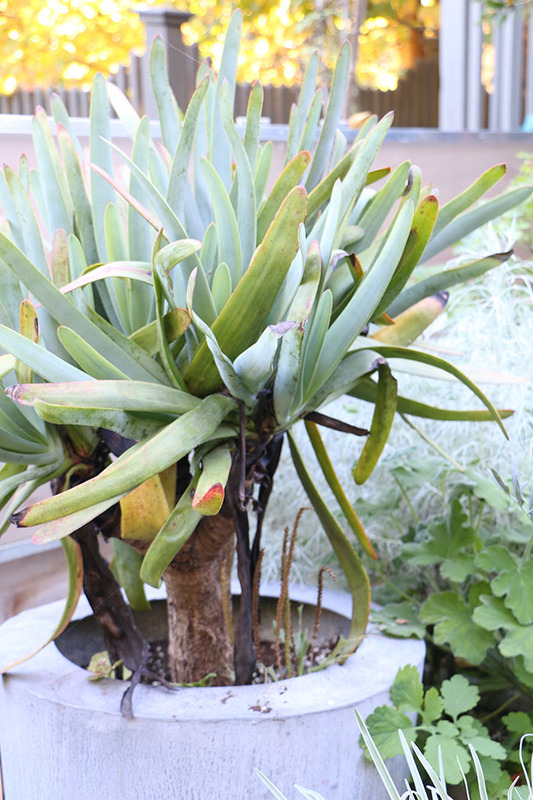 Succulents, cacti and echiveria still go into the cold greenhouse where they remain dry most of the winter. This tree aloe keeps growing, and although it wants to bloom in the coldest months - usually January when the day length is short, it seems to handle the cold, damp temperatures and even a light freeze which usually destroys the flower stalk. It would be much happier indoors near a sunny, bright window though. It's just too big now to bring into the house. Most succulents do quite well indoors throughout the winter as long as one can provide the brightest light. Sunshine, actually. Aloes, gasteria and agave do just fine on a windowsill with southern exposure. The larger species, however, are more challenging, if only for their weight and size. Around here, we've stopped raising most agave as the thorns can injure the dogs' eyes, if not our own. The few I do keep are planted in taller pots and are very resilient as most succulent plants are. Many if not most of my succulents simple spend the winter yanked from their pots (before a hard frost), and laid out on seed trays which I set on the high, dry benches in the greenhouse. This blatant abuse seems to suit them. Few grow even a tiny bit until the days start to get longer, in late winter, which is when I pay them a little attention. If you wish to save you echeveria, aloes or sedums, they should be the most tolerant of indoor conditions, only demanding the brightest winter light, and more water if kept on a warm windowsill, but less if you are keeping them in a cold room or garage window that doesn't freeze. Citrus, like this Mandarin orange enjoy the greenhouse, it's sun and moist air. Indoors, I may set it in the studio, an unheated room which is bright, but not sunny. This room stays near 40 degrees most of the winter and has bright north light, not unlike a French orangerie. 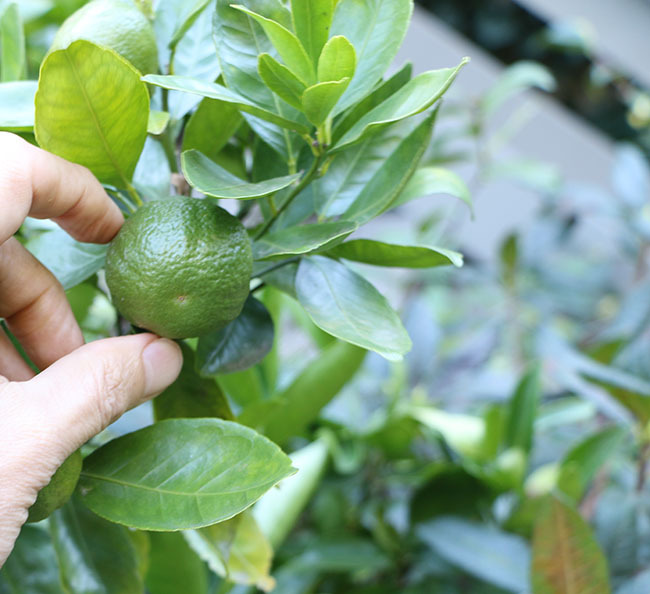 I can remember how exciting it was to grow my first citrus - a Key Lime plant purchased from Parks seed - it was probably 1969 and I was ten or so. My grapefruit seedlings were my real treatures though, even though I knew that they would not produce any fruit, I kept all of my citruses as large houseplants until I left for college a decade later. Citrus can grow quite well indoors, but it helps if you can do a few things. First, setting plants outdoors for the summer is key. Most will bloom then, and pollination is aided, as well as the rain and bright sunshine which helps eliminate any pesky insect infestation they might get during the winter. It seems ever winter brought an infestation of scale or mealy bugs. At this time, I am continuing to keep all of my citrus in the greenhouse, but next winter I may try moving them indoors for the winter again. My first choice will be the studio, an unheated room which does drop down near 45 in the winter. A mini- orangerie. Camellia grown in pots are challenging to indoors in the North. I have seen them kept in protected porches which are glassed-in (we do have one, but I have not tried it yet), or in bright breezeways. 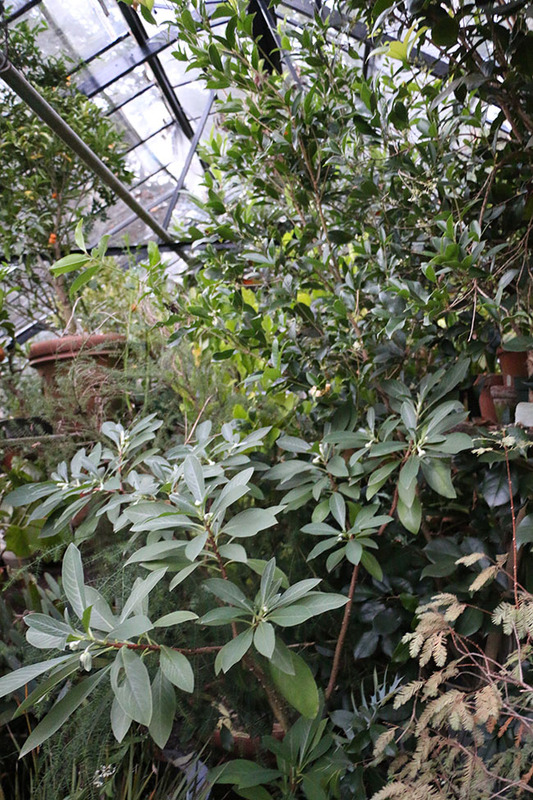 Camellia can freeze, but like many plants, it's their roots which need to be protected if they are kept in containers. When it comes to raising camellias, one is really limited to keeping them under glass. While citrus can do well in a cool room indoors like an unheated bedroom, a sunroom or a garage with windows and heat - the camellia is harder to trick. Yet, in a cold greenhouse they practically care free. Able to handle moderate freezes except while in bloom, with the protection of glass, the camellia thrives in pots in the north. They are really a relic of the past, however. Unless you live in the south or the far west, the camellia is just rarely seen, but read any old 19th-century gardening magazine or book, and one quickly discovers that the camellia once ruled the winter florist trade in the bid North East Cities like New York and Boston. They thrived in cold florist greenhouses, blooming from autumn until March, making the camelia the 'it' flower for Victorian corsages, turn of the century holiday decor and in the conservatories of the rich. Today, they are so rarely seen as a potted plant outside of where they have grown int he garden, that one could say that the camellia is rare. This appeals to me so much, that I feel that once I stop heating the greenhouse, my hopes are that the camellias might still survive, especially those planted in the ground. Most can handle cold temperatures, at least in the 20's, and a thin layer of glass might afford me that 'winter garden' atmosphere heated with just radiant heat from the ground, and maybe barrels of water which might retain some heat from the sun. Edgeworthia is a semi-tender shrub, not hardy in most of New England but often grown as a container plant in a conservatory or cold greenhouse. It's a big shrub, and it has a curious growing habit - it forms little 'buttons' of flower buds in the late autumn, so I have to try and keep the tubs outdoors until the Holidays so that they can mature. 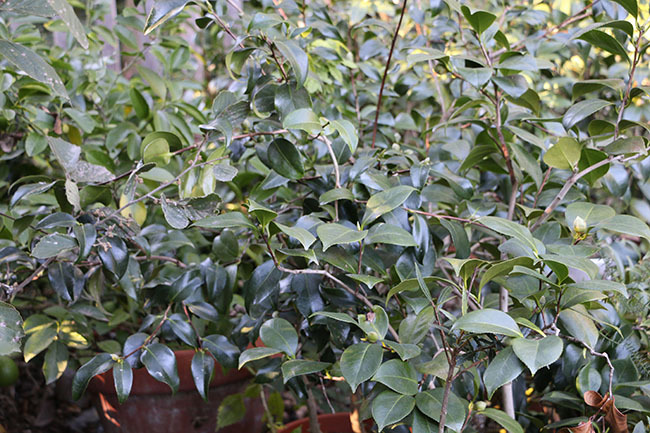 Unusual potted shrubs one commonly raised in cold greenhouses in the 19th century, or new ones recently introduced from milder climates are other plants which might do well in an unheated or marginally heated greenhouse. This weekend I purchased a rare Stachyurus from a plant auction in Boston for example which might do well in a container underglass, but classics here include Daphne odorum which has been enjoyed through most of the 1800's here in New England by those who could afford a glasshouse. Edgeworthia blooms in the winter underglass, as you can see here, but these 'button' shaped buds take time to mature, just as the foliage is getting nipped by frost. I try to protect the plant from hard frosts as long as I can, to allow these more tender buds time to mature. This year I have a good crop of them it seems. 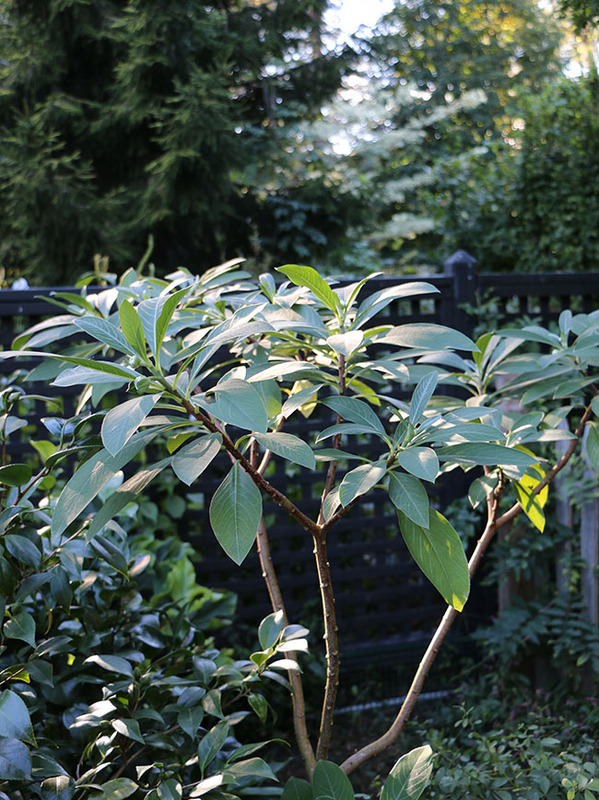 The Edgeworthia has grown into a large shrub. I know that I can keep it smaller by keeping the pot size small, but I also want it to bloom heavily. Looks like this year I have an excellent bud set already. The more rare South African bulbs which are generally summer-dormant are emerging now in their pots, like this Haemanthus humbles ssp. hirsutifolius showing its hairy habit. I know for some collectors, this blooms first but my plants are seed raised from a wild population. Fall also marks the time when my collections of Southern Hemisphere bulbs begin to grow in the greenhouse. There are so many, that I usually touch of a few thematic groups in a post here. For now, I shall spare you the boredom and just say that "they are beginning to grow, again.". I keep learning with each passing year with these bulbs, and usually just when I think I have things figured out, they surprise me. 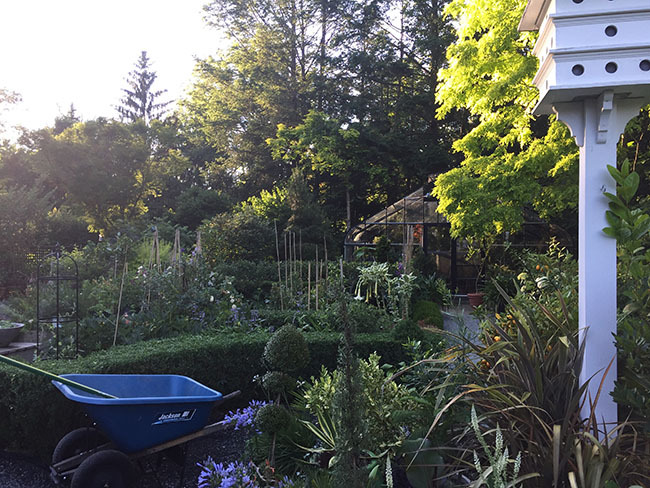 This year, I have been lazy - not offering water until just this week (usually, I start watering pots of dormant winter blooming bulbs in late August or September). This late "rainstorm" style of watering isn't new, for a few collectors I know practice this, but now I can see why. The bulbous oxalis species which are just beginning to emerge, appear dense and are sending up flowers before foliage - the same goes for the species cyclamen. 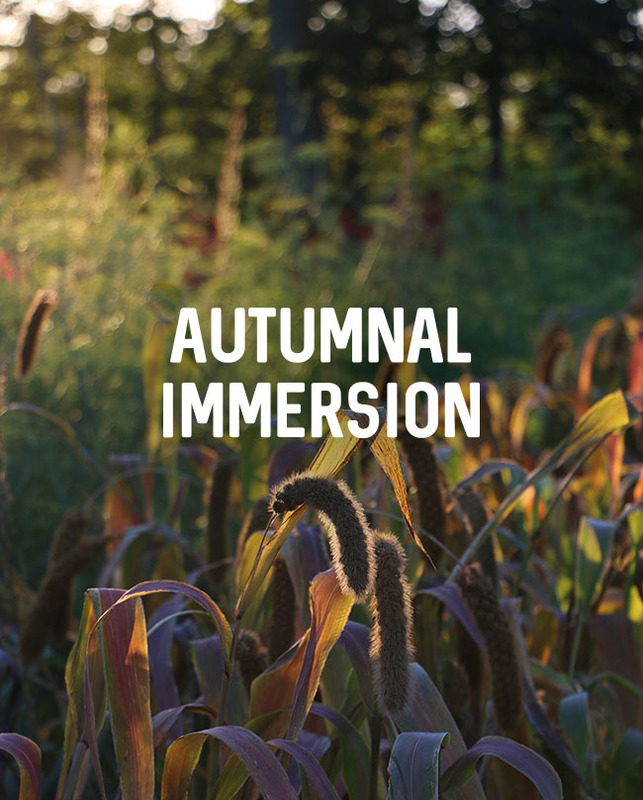 In their native habitats, often the autumnal or winter rains are late, and plants have to depend on other triggers - usually day length, or temperature shifts, as signs to begin growing. Many of these bulbs enjoy a field fire as well, as they grow in areas where fierce fires occasionally ravage the meadows and grasslands, triggering some species to bloom and set seed. Fire doesn't hurt native plants (such as those in California, Australia or South Africa), especially bulbs which sit deep into the ground. Some collectors even use smoke-sheets - disks of paper impregnated with smoke chemicals, which stimulate some of these bulbs to bloom. 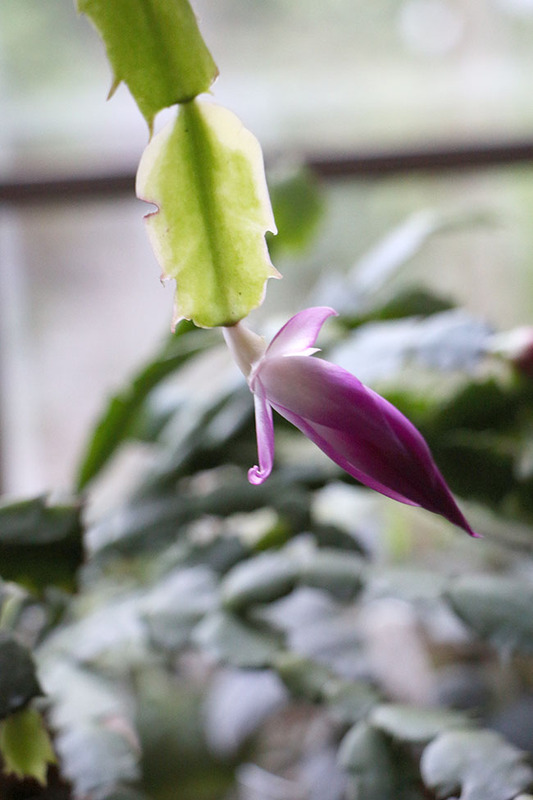 A variegated Christmas Cactus with a massive flower bud, appears to be earlier than normal, this year. Of course, like many of you, there are dozens of plants which still need to be planted in the ground! I need to stay away from those fall plant sales! Fall crops are over-producing including chili peppers (for my book), root veggies like carrots and parsnips are ready to be dug, and Asian long beans arrive. Officially this warmest October in recorded history (here in New England) had no frost in the forecast meaning that the garden continues to produce. 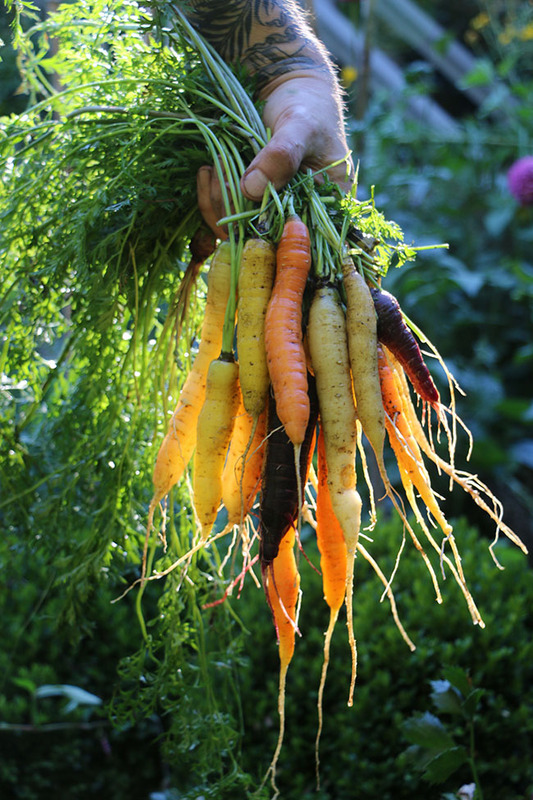 Colorful rainbow carrots hardly perfect but fragrant and flavorful, unlike and store bought carrot. 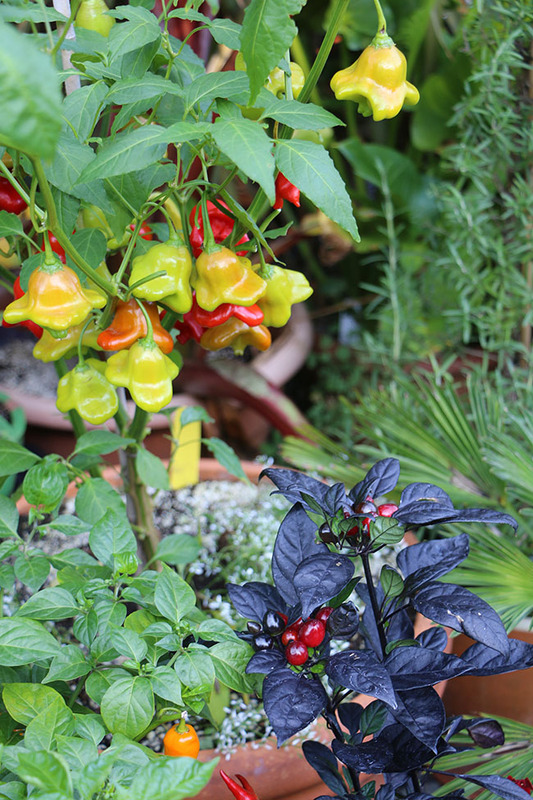 The ornamental 'Black Pearl' chili is edible but mostly, it's grown for its black foliage and black, imature peppers. 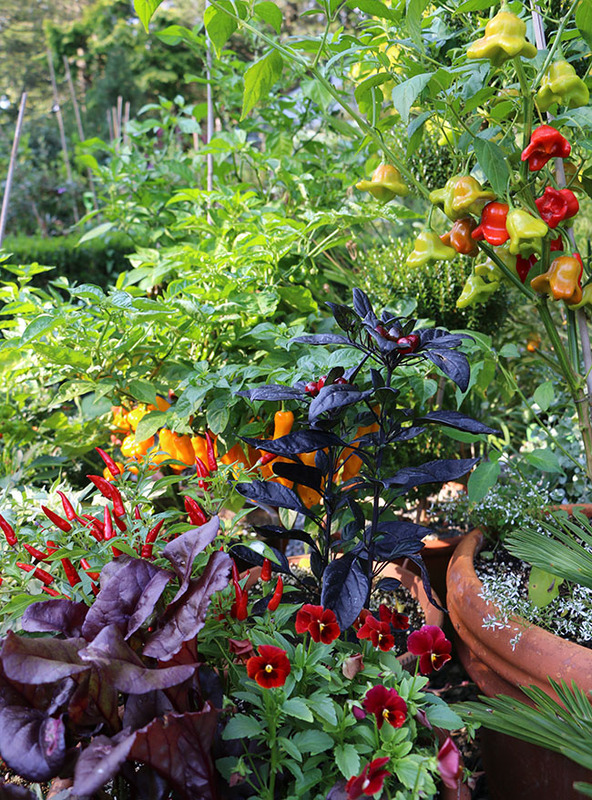 On the left, a Bishops Hat chili shows off all three colors. All of these peppers have been grown in pots this year while culiunary types (sweeter or peppers which we need in abundance like banana peppers are grown in rows, planted in black plastic mulch). 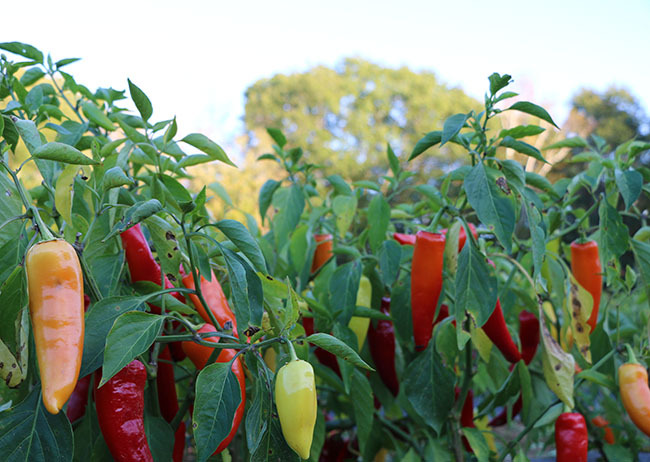 Cayenne peppers are still ripening, but given our warmer than average autumn, most may be red in a few weeks. Black plastic for the culinary peppers keeps the soil warm and extends the season right up to frost. 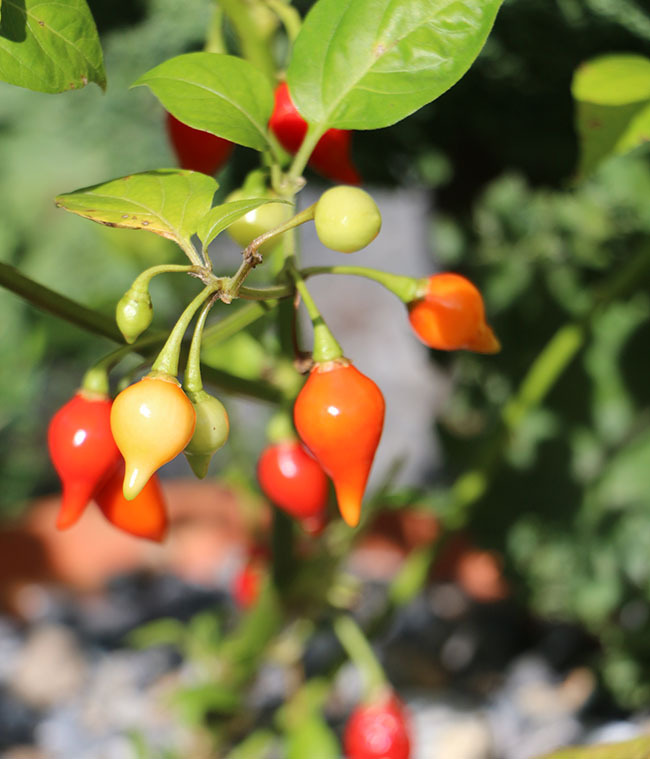 This 'Bishops Cap' chili (not the 2017 AAS winner 'Mad Hatter', but similar) is hot, but not shockingly so. It's been a fav around here as while hot, it's not deadly. Our 'Carolina Reaper's, Ghost Peppers, various Scorpion's, hababero and Jolokia-types are still too hot. I'm trying to make some hot sauces so that they don't go to waste, but man-oh-man, my first two batches were inedible, or un-inhalable! Autumn containers are looking bright and colorful. All of the chilis are being raised in pots this year, which was an idea I got while visiting Amy Goldman's farm last year. 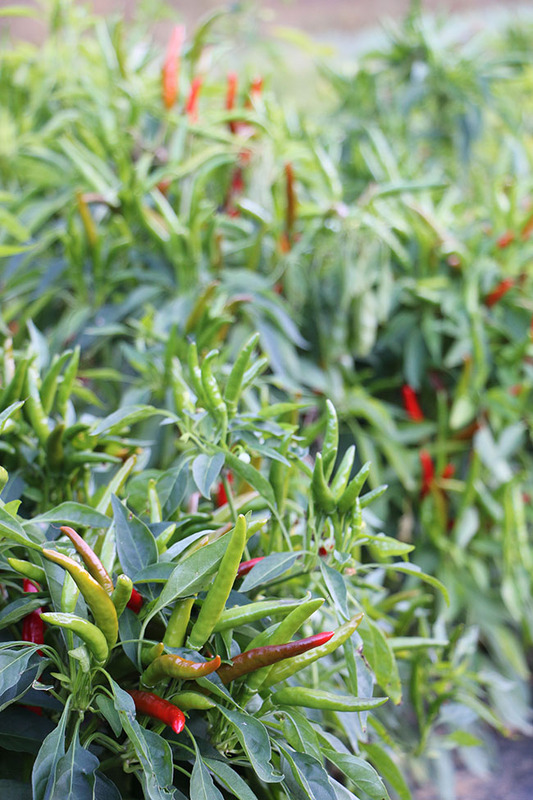 Sure, she had a field of peppers, but many were also grown in pots. 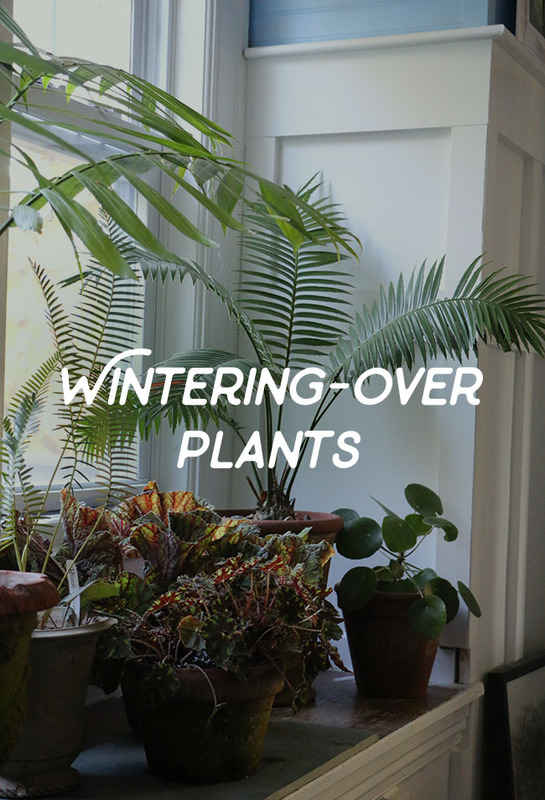 They make attractive plants, and many people keep certain varieties indoors in the winter. 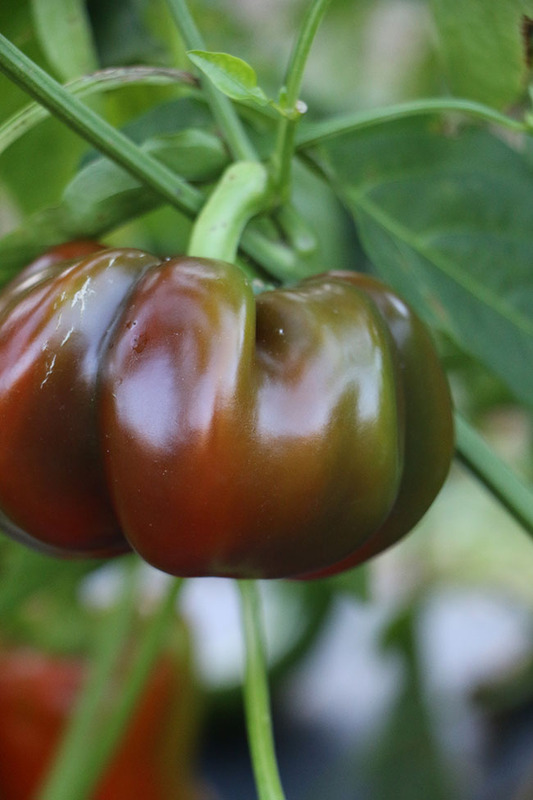 'Gambo;, an heirloom stuffing pepper is a bell type, sweet and great when picked either green or when red. 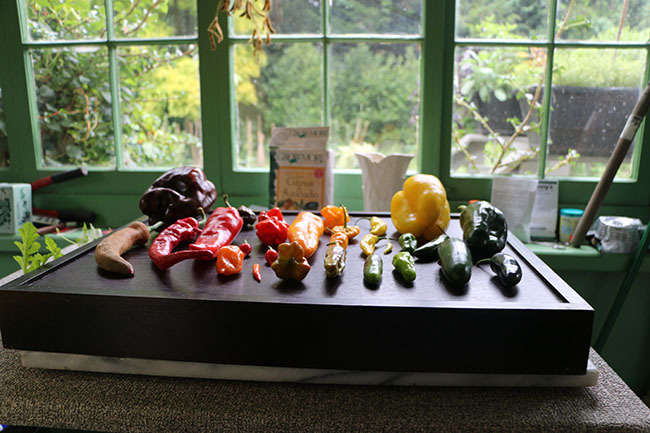 Many 'Hungarian type' of peppers exist but few are as fruitful as the traditional tri-colored selections. 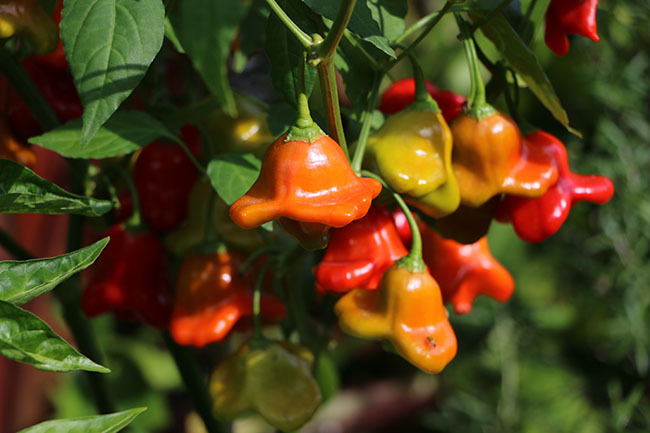 The varieity kniown as 'Hungarian Hot Wax' is one of the most abundant peppers that the home grower can raise. 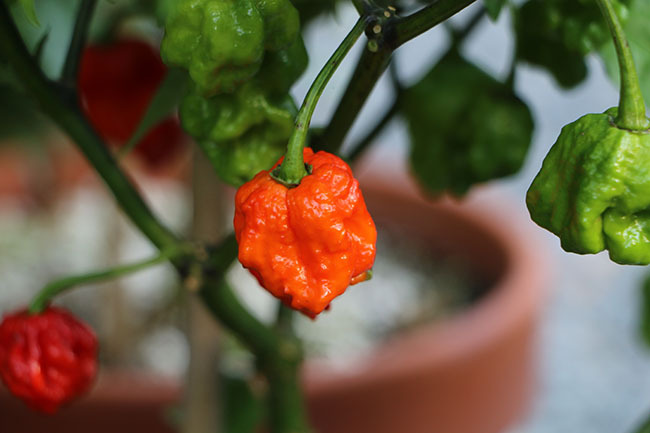 'Carolina Reaper', considered to be the world's hottest pepper looks as hot as it is reported to be. Coral-red and blistered, it dares us to taste it, but I wont! Nope. Just pretty as a photo prop! 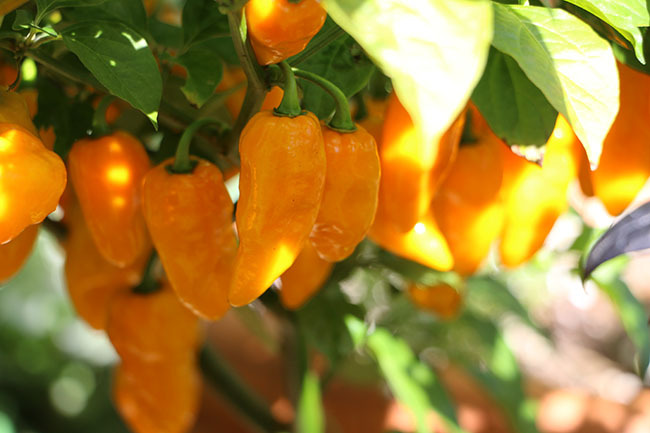 'Biquinho', a BRazillian landrace pepper means 'little beak'. Also known as 'chupetinho', I have not tasted nor cooked with this tiny chili yet. It is said to have a slightly smokey flavor (I wonder if that is because it first burns your mouth? I am now a little spooked!). Yellow peppers are always showy, and while lovely, these 'Yellow Ghost' peppers may just remain on this plant after I tasted one - (just one - just a tiny bit on my tongue. I mean really - who eats these things?). I've been shooting chili peppers for about a month. Honestly, I have not counted how many varieties I have but there must be more than 30. I still haven't found the perfect way to shoot them, trying everything from arranging them in color order, to individual portraits. I am still experimenting with layouts and style, it seems everything has been done already and it's tough to find a new style. 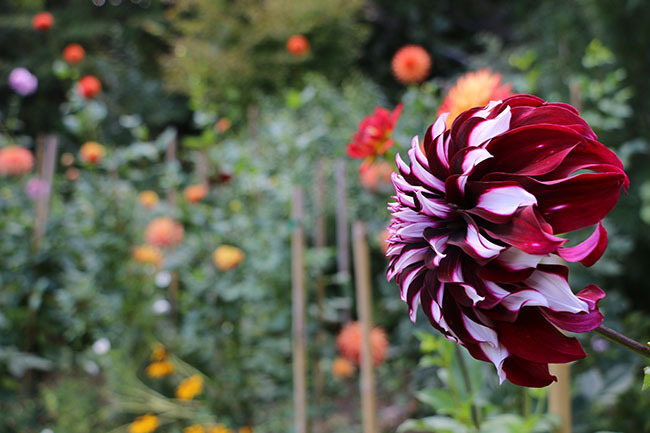 Of course, the dahlia garden has never looked good now that all of the local dahlia shows are over! This blackish red one is 'Tartan'. 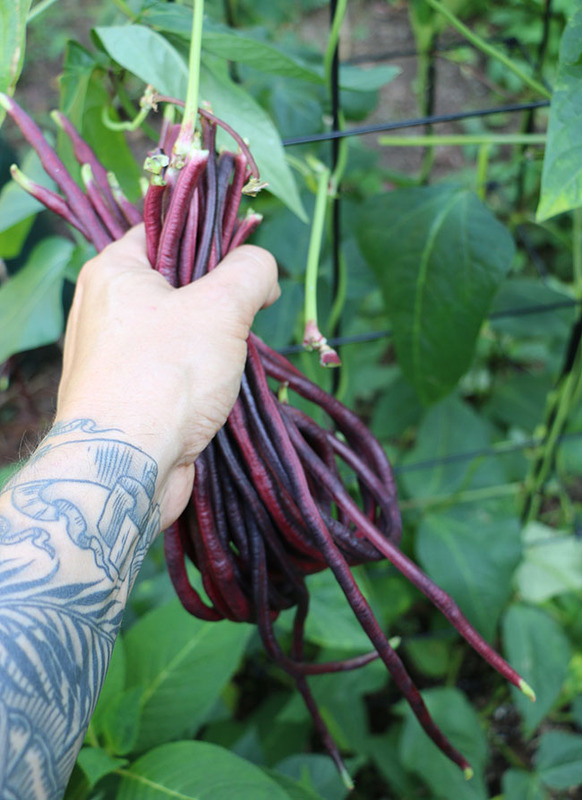 Chinese long beans are a first-time crop for me, and I am addicted to them. This second picking is shorter (still long a 14 - 16 inches) than the first picking which had beans nearly 24 inches long. These "red noodle beans' are abundant and tender. 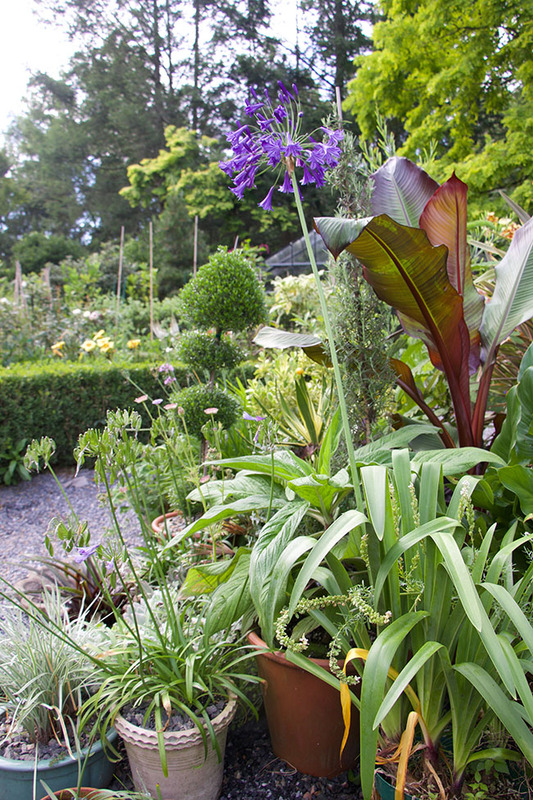 Both the green and the red varieties will always be included in my planting schemes from now on. 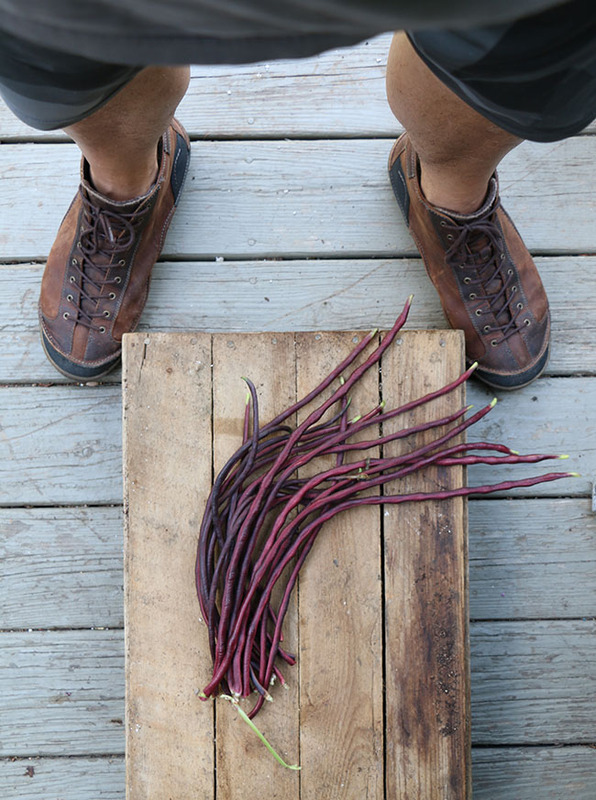 Grow them like pole beans (I use tall pole-bean towers from Gardeners Supply), which are tall enough for the long beans to dangle without touching the ground. The parsnips that I planted this spring are nearly ready for pulling. A few were dug this weekend to see how long they were. 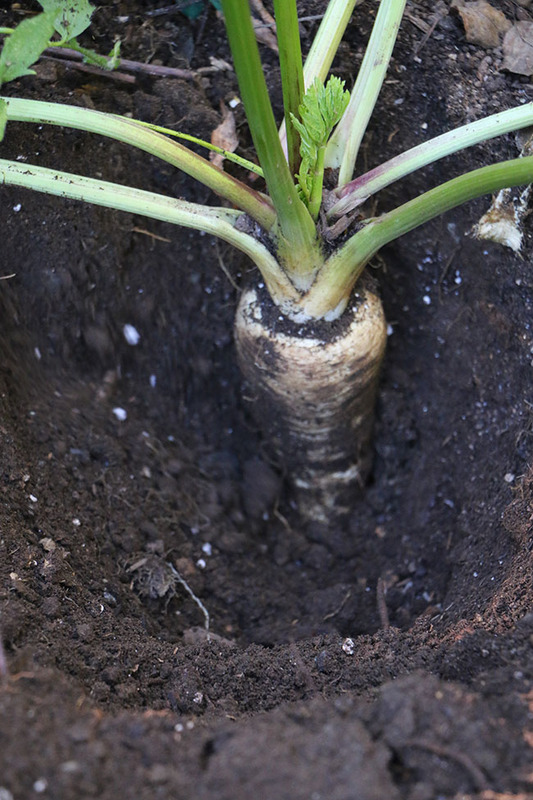 I don't want to give things away, but this year I grew my parsnips in the same way serious competitive parsnip enthusiasts grow theirs in England (drilling a deep hole, setting in long seedlings, etc), and I can report that the results were impressive. Not that any human needs parsnips this big and long! The best and step-by-step shots are saved for my book. Parsnip pride. Long, deep and as wide as my arm. The row will be dug throught the winter, as these roots will be sweeter once cold weather knocks down the foliage and freezing weather arrives. A thick layer of straw over the row will allow me to dig parsnips all winter. 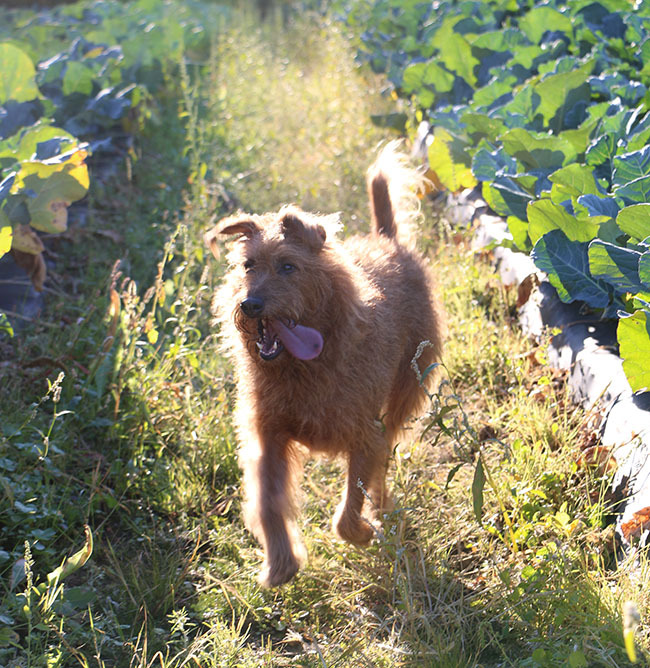 Some local farms are allowing me to shoot crops in their fields, which Daphne (Doodle)s loves. Nothing like a run down a long row of Broccoli in the autumn sunshine. She can use the exercise.